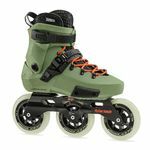 Grindhouse proudly presents the latest innovations from the colorful world of inline skating: stylish 3-Wheel skates. 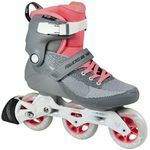 Equipped with only three instead of four wheels, these dynamic model skates are ideal for leisure, fitness, speed, and off-road. Here, less is more: due to the compact size and the short rail, the 3-Wheeler can be very easy to maneuver. They are nimble, agile, and comfortable. Less hardware also means less weight. And with its large wheels, it can be quite fast! You want to make relaxed curves through the city, run laps in the park, roll to work, or do something in your free time? 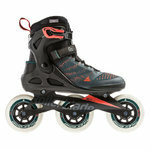 3-wheel skates are your perfect companion. 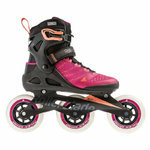 And if you would rather skate more rugged terrain: just check out our off-road skates. In them, you will find your suitable model to brave unpaved roads, rocky dirt paths, woods, and cobblestones, with sturdy shoes and shock-absorbing air tires. At Grindhouse, you can easily buy the 3-wheeler of your choice from home. If you are looking for a very special gift, you've come to the right place. 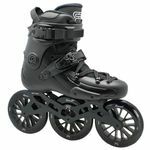 We have the latest Skates from Powerslide and Seba, special accessories such as quality wheels, frames, ball bearings, and chic accessories. Whether you think a 3-wheeler is for you or you are shopping for others: our online store at Grindhouse provides you a wide assortment at fair prices.